The underlying principle to every marketing strategy is this: Reach your customers. If you’re not getting through, there’s absolutely no point. Marketers are like virtual parkour runners constantly dodging and jumping over hurdles to get to their audience. Unfortunately, some of those hurdles have become accepted as norms—like the fact that a business is doing well to have an email campaign open rate of only 25 percent. This is why Andrew Warner of Mixergy believes chatbots are the way of the future. Businesses want to engage with their customers by creating a relationship, so why not communicate with them the way they communicate with their own friends and family? According to Andrew, by replacing the standard email list with a well-thought-out chatbot, you can significantly increase engagement with both established customers and prospective customers alike. Why chat is a better way to reach your customers. Why chatbots are not ready to replace humans for many interactions. How to implement effective chatbots. How to approach sales within a chat. Andrew admittedly doesn’t like sci-fi, but is in fact a huge fan of romance movies! What are you watching right now on Netflix? Fauda is one show that Andrew is really into. He’s also very excited about the many foreign films and TV shows that are being included on Netflix lately! 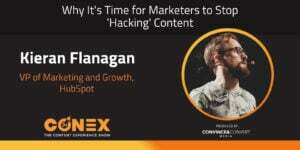 Anna Hrach: Hello, everyone, welcome to the Content Experience Show Podcast. I'm Anna Hrach from Convince & Convert. For those of you who tune in regularly, you might be saying, "Wait a minute, doesn't Randy usually do these intros?" And, you would be 100% right. Unfortunately, Randy couldn't join us today, so it is just you, me, and our amazing guest this week, Andrew Warner. Andrew is a man of many talents but most notably he runs the podcast Mixergy, as well as the company Bot Academy, which teaches people how to build, use and sell chatbots. Now, the focus of today's show is chatbots, because this is something Andrew knows a ton about, but it's also something that is rising steadily in popularity, too. It's also something that we, as content creators and strategists, really need to think more seriously about and get more involved in. That's because obviously chatbots require real written content in order to work and interact with people, but also they're an integral part of our entire content experience. And, how we use them and what we use them for can actually really make or break our audience's experience with us. Now, I don't wanna give away too many spoilers here, because Andrew has a ton of great advice and perspective and I will just let him give that on the podcast. But, as a bonus, he actually provides an awesome link that he has set up specifically for this podcast and for you, so you can go check out and play around with a really great chatbot he's created, and you can actually go in a test environment, see the multiple different capabilities it has and all the different ways that you can use a chatbot. It's really, really cool, but you'll just have to keep listening for that link. I will say, before I bring Andrew in, that my only regret for this show, which was dedicated entirely to chatbots, is that we didn't make a single reference to Skynet the entire time, not once. So, maybe we'll just have to have a followup session, where we can connect the dots for how chatbots suddenly become the terminator and we all defeat Skynet. So, I guess until then, let's just go ahead and bring in Andrew, and hear what he has to say about chatbots and the Content Experience. Andrew, thank you so much for joining me today. I'm so excited to finally get to chat with you. Andrew Warner: Glad to be here. Anna Hrach: Nice, all right. So, Andrew, you and I got to know each other a little bit before we started recording, but would you mind just telling everybody a little bit about yourself? Andrew Warner: Yeah. I'm an entrepreneur who built up an email marketing company and sold it a few years ago, and then got into doing podcasts and courses by proven entrepreneurs on a site called Mixergy. Most recently, after making a few angel investments in chat companies, I created Bot Academy, which I'm hoping to get some time to talk about today. Bot Academy is a place where, if anyone wants to have a chatbot for their business, we can teach them how to do it, or they could hire one of our graduates to do it for them. Anna Hrach: That's super fascinating. How did you get into the bot side of things? Obviously, it's a huge trend right now, but you've been doing this for quite a while. So, how did you get into it and what led you down the bot path? Andrew Warner: At Mixergy, I hired a producer and videographer. We went to this well known entrepreneur's house, Justin Kan, to record a course with him. It was a great piece of content. The guy started multiple companies, including being the co-founder of Twitch, which he sold to Amazon for about a billion dollars. So, we were proud to have him on. We were proud of the content we were creating. And then we sent out an email, and I realized this is not actually gonna get as many people to check out this program as I'd want. And we put in all this effort and it's really good. And I thought back to my previous years' work on my email marketing and I realized that when things weren't going well, I hired a copywriter, someone much better at writing than me. One of the best copywriters ever, and she did a great work. I'm proud of the work but our open rates didn't dramatically double, triple, didn't dramatically increase. Our click rates didn't increase and I thought [uh 00:04:20]. So, then we went to this company that was going to help us with our email funnel, and she and I spent two days working with them intensely on our funnel and we worked on the software behind it and all that. I came back and the email rates didn't change, not open rates, not click rates, and I thought, this is a problem. Maybe people just don't like me. Maybe they don't like my work. And then this entrepreneur that I invested in showed me some stats from MailChimp that showed that across the board, it's super hard for anyone to get over 22, 25% open rates, and they showed their stats at MailChimp. Across the board, to get over two to 3% click rate, is impossible nearly, for many businesses. And I realized, oh, we're doing much better than that. The problem isn't us. The problem is this medium of email. It's just not growing. It's not getting more people excited enough to open up the next email marketing piece, or excited enough to click on it. Then I thought, "How do we fix this?" And then I realized something. When I talked to my copywriter, she and I were text messaging each other. When I talked to her community manager, we were using Facebook Messenger to talk to each other. Our developers were using Slack to talk to each other. My wife and I were using iMessage to talk to each other. We're all using messaging apps to talk to the people we love and the people we work with. Then why are we relegating our audience, our customers, to email? A tool that none of us love. And I thought, "How do we get to use the tool that we love to communicate with the people we want to buy our products who we love enough to create products for?" And that's when I discovered chatbots. And chatbots can do so many different things. In fact, I invested in a company called Assist that will basically make a bot into like a human brain. They're pretty far along the way and they're gonna get there soon. Didn't make it as smart as a human being, but we're not there yet. And I'm not trying to do all that. I learned from them but what I realized is, for me, all I need is a new way to reach my audience, to recognize that people don't love email the way they used to, but they do love chat. So, I wanna reach them via chat. Andrew Warner: I'm gonna agree with those people. It doesn't do that. It is not useful. If we sit in front of a bot and we try to get it to figure out why our delivery from Amazon didn't arrive, it's not gonna work. And it's just gonna be a disappointing experience for us, which is why, when you can't find your shoes that Amazon was supposed to deliver you call them up. But, that's not what we wanna do because it doesn't work. I think in the future it will. It's just not there yet. Anna Hrach: So, do you think the way the chatbots have been adapted so far has been totally wrong? Andrew Warner: Yes. I think that because we see the power of it, we want it to do it today and that's a mistake. Anna Hrach: Like, we want it to replace humans, basically? Andrew Warner: Right. It's not going to. Not today, not this year, not 2018, not 2019. At some point in the future it might. I could see a world where it absolutely does that. Right now, webpages replace human beings for me. In the past, I might have said, "Hey, you know what? I really want pizza. Is my pizza place gonna be open?" Or, "Arizmendi on Valencia near my house, they make one type of pizza every day. You could only have that type of pizza. I wanna know what it is." In the past I might have called up to see what it was, or asked a friend who ordered pizza from it what it was. Today, i go on to their website at Arizmendi and I see what their menu is for the day. So, websites have replaced humans for some things. I could see that chatbots will replace humans for a lot of things in the future. We're not there yet now, but you know what? So, Randy's not here. What is he, getting his hair done? Why is he not here by the way? Andrew Warner: He is a very good looking man with great hair. I've known him now for years. The guy has got good hair. So, you're saying he's not getting his hair taken care of today? Andrew Warner: So, when you and he were communicating about whether he was gonna make it here or not, did you email each other? Anna Hrach: Yes. He emailed me, but I was in a meeting, and so he then texted me when I didn't reply. 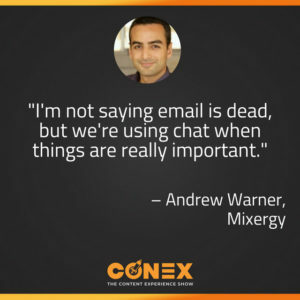 Andrew Warner: So, this is the thing, I'm not saying email is dead, but I'm noticing that we're using chat when things are really important. We're using chat more often. So, all I'm saying is, our audience is preferring chat. How about this? We all have websites. I'm imagining most people who are listening to us, almost all, will have a website, that someone can come in, enter an email address, and sign up for an email newsletter. We may not call it email newsletters, we might it updates. We might call it something else, but we have some form for them to fill out to get that. What I did, as an experiment on my side, on Mixergy was, I replaced that form. That form where people will type in their secondary or they're just watching other people's mailing list email address. The form where people type in a bad first name because they don't trust the form enough. I replaced it with a single button. So, now I said if anyone wants to subscribe they could just press that button and as soon as they do, I can send them messages via Facebook Messenger instead of email. That little experiment meant that more people were signing up because they didn't have to fill out a form. They could just press a button. I also could put their photo and their name underneath it, which meant that they trusted that even more. And then, instead of sending them long emails, which, long content totally appropriate for email, what I do instead is I send them short messages. And if they want more they could press a button, they could interact and they could ask for more. And what my messages do is, so that I'm not frustrating people, so that I'm not overwhelming them, is teach one little thing a day. One little thing a day, via text. One little thing, small bite-sized content. That is the future. You're seeing in Asia that there are people who are consuming books basically via text because they prefer small little bites of content. This is the wave of the future. This is what's happening. So, if my audience is moving towards text-based communication, I have to communicate with them that way, too. Anna Hrach: Interesting. So, this is super fascinating. Even just the way that you illustrated the point about just texting in general and how that's becoming our go-to medium and just really short form messaging as really just taking the place of everything. What are some of those effective ways? You already outlined so many of them, but what are those effective ways that marketers can really start to use this, and how can they start to even just adopt this slowly and in the right ways? Andrew Warner: Here's what I'm gonna recommend, anyone who's listening to my voice right now could hear me explain it, or they could just go and touch it and see it. I created a bot at botacademy.com/contentexperience where anyone listening to me can try it. I created one just for our conversation. Again, botacademy.com/contentexperience. I'm gonna put a picture of Randy's beautiful hair on there, so people can see that they're on the right page when they get there. And here's what they're gonna find when they go there. First of all, a single button. No form, no place to enter bad information. They press the button and immediately their phone will vibrate, and when their phone vibrates it'll send an alert at the top of their phone that they could tap to open the message from me. And once they do, they could experience the full message. And that's what I want people to see, that our messages are not long, I would highly recommend that people keep their messages short, meaning three sentences or less before the next user engagement. I highly recommend that people put in pictures, a lot of pictures. If you look at your text messages with the people you communicate with, there's a good chance that there's not long multi paragraphed messages being sent to you. That's what we should be doing when we're communicating with our audience using our chatbots. Keep it as short as we would with our husbands, with our wives, with our bosses. There's a good chance that there's photos in there. Use that. Photos within your chatbot. There's a good chance that there a Gif in there, a little bit of animation to bring life to the message. Use Gifs occasionally. There's a good chance there is emoji in there. So, use that when you're communicating via chatbot. What we're trying to do is replicate the way that people already communicate in chat with the people they do business with and they love. Anna Hrach: Okay, so, while everybody's checking out that link, we're gonna take a super quick short break to hear from our sponsors, and a special message from Jay. But everybody stick around, because when we get back from break we're gonna dig even more into this. Go play with the bot, check it out, see it, but stay right here. We're gonna be right back. TechSmith makes it easy to create professional videos and images. With tools like Snagit and Camtasia, everyone can create custom screenshots, screencasts and videos. No experience required. Need to share campaign results with people who aren't familiar with what CTA, PPC, or SERP means? Use Snagit to capture results and share them out as screenshots and screencasts. Need marketing Jay videos but don't have a video production team? Camtasia is geared towards those who have never made a video before, ever. Communicating with visuals like screenshots and video is seriously easy with TechSmith. Visit www.techsmith.com/contentexperience to learn more. Again, that's techsmith.com/contentexperience to learn more. Jay Baer: Hey friends, it's Jay Baer. Imagine experiencing all the awesome that is Conex but live. Everything you love about this podcast but for two days in three dimensions in a beautiful theater in Toronto. 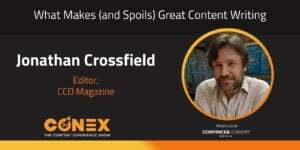 This year, August, you're gonna hear from the best speakers about content marketing at Conex, a truly intimate networking experience with 750 marketers. I'm the co-producer of this event organized by my friends at Uberflip and we're gonna bring together brilliant strategists and brand marketers from all over the industry in Toronto. It's August 20th through the 22nd. Every single session is a keynote. The speakers have been handpicked by me. They include Andrew Davis, Scott Stratten, Tamsen Webster, Amy Landino, and leaders from DocuSign, 3M, Bluewolf, Pardot and more. 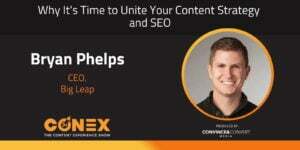 Get your ticket today at conex.uberflip.com. That's conex.uberflip.com. Use the promo code Podcast to save $50 off your ticket. I will see you in Toronto. Anna Hrach: Hey everybody, welcome back. We are talking with Andrew Warner about chatbots. So, before the break he gave an amazing URL that everybody can go check out. Now, what we wanna talk about is, exactly how to create content for chatbots. So, Andrew, when I think about chatbots and everything that you've talked about within this episode, I hear a lot of crossover between content, user experience, design, marketing. It feels like there are so many elements that go into this. How do you start planning to create content for your chatbot and how do you actually get it to be useful to customers and audiences? 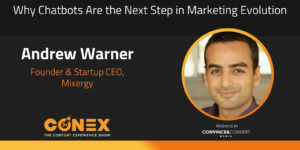 Andrew Warner: So, one of the first things that we want you to understand is, where are your customers now and where do they wanna go. So, for example, imagine someone were coming to us asking for a chatbot for their running shoe company. We might ask them, "Where are your customers now? Where are you wanting to go?" And they'd say, "A segment of our customers are non-runners. So they don't run at all. Where they wanna go is to just do a 5K. A 5K would be a huge win for them. What's that, about three miles? That's their ideal goal. They're coming to us to buy these shoes for that reason." So I say, "Great. Your chatbot is going to take someone from no running experience to their first 5K." And so what you do is you say, "We have a bot that's going to get you to run your first 5K. If you want to do this press the button below." That's your call to action. As soon as somebody presses the button, you show a runner in their chat app, in Facebook Messenger, picture of a runner, 'cause I want you to use visuals a lot, and underneath that, the first bit of text that they see should say, "Can I use this chat window to teach you how to run a 5K?" And have a button that gets them to press yes. I want the recipient to understand exactly what's coming and to press a button to commit to getting those messages. It's not necessarily required by the platforms but it makes good sense and it sets up the user to understand what they're in for. We have found that over 90% will press that button. They specifically ask for it on your website, so when they see that question in their chat window, in their chat app, they're 90 plus percent likely to press yes to it. The five or 8% who don't, you don't wanna message them anyway. That's totally fine. Okay, so then your first tip. First of all, you acknowledge. Maybe you show a picture of a couch and you say, "Look, most of us are sitting on the couch and we have never run a marathon before, but do you wanna know a secret about running a marathon?" So, you're asking a question, and then you have a button underneath it that lets them answer the question, and the answer could just be as simple as "Yes, I do." And the reason you wanna do that is, you wanna have a visual, a little bit of text, and you want the user to keep pressing buttons and respond so that they're active. People don't wanna sit and chat and read paragraphs and long messages. They want to be fidgety, they want to message back. And so you say, "Here's a couch. Do you wanna learn how to run your first 5K?" They press a button that says yes, and you say, "Okay, here's your first step. Your first step is ..." and then you tell them what your first step is. And then at the end of that you say, "Tomorrow I'm gonna tell you the next step that most runners miss and because of this they never run again." So, now you're setting them up for expectation. "Tomorrow, I'm gonna message you again." The next day the phone vibrates because you're sending them another message just like you promised them, and this time it's a picture of someone hurt. And the text says, "Can I show you why many people don't run a second time after running a first time?" And there's a button. They say yes, and as soon as they press yes, you show a picture of someone stretching and you say, "If you don't stretch your body's gonna hurt so much the next day that you're not gonna run again. Not in the next day, not the day after that, but there's a simple stretch that will help you get to your first 5K in the next three weeks. Can I show you an animation of it?" They press a button and then you show a gif of the stretch that they do. And then you complete that lesson and you say, "Tomorrow, I'm gonna show you, you can get to one mile, even today, even if you've never run before. Look for that message. In the meantime, go enjoy your day." So, this is the way we're doing this. We know where they wanna go and our bot is slowly taking them towards that goal every single day. Anna Hrach: That's absolutely amazing. So, a couple of things that struck me as you were talking. One, it very much feels like you're following some really core classic email best practices, like, opt-in and even letting them know that "Hey, we're gonna send you a series of things, is that okay? Do you want this?" Which, is just a best practice but also, on the flip side, the way you would actually have a real conversation, too. Again, not that we're replacing humans but if I were to go up to a counter buying a pair of running shoes, I wouldn't want the cashier or somebody at the desk to say, "Hey, great, oh, you're running your first 5K. Let me tell you about these things. Let me tell what ..." you're like, "Whoa, whoa, whoa. Hey, I'm just buying some shoes here." Anna Hrach: So, it's very much like, if they were like, "Oh, are you running your first 5K?" "Why yes, I am." "Oh, cool, do you want some tips?" "Yeah, sure, that'd be great." It's an actual sort of, for lack of a better term, conversation that you're having and you're making sure you're giving them the right information when they want it. Andrew Warner: And there's some people who are ready to buy right now, may not want the conversation. Take them directly to your sales page. Don't even ask them to sign up to a bot. I've got a type of bot that will work great for them and we can come back to that in a moment. But, I wanna say that most people are not in a place where they just wanna buy running shoes right now. They're trying to do something else and running shoes are part of the way that they do it. They're trying to run a marathon. They're trying to have more comfortable walking experiences. They want to do something and the shoes will get them there. They wanna look better. Let's talk about selling within the bot. Andrew Warner: You cannot arbitrarily fling sales messages to users in chat. If you do, Facebook will ban you, and you notice that Facebook for a while there stopped allowing people to create chatbots. Part of the problem is that people were doing things that they weren't supposed to within chat. It's super powerful. It can actually sell, and so people were flinging sales messages and getting sales and thinking that they were doing great, but in reality what they were doing was destroying the whole medium of chat for everybody, for marketers, for conversationalists, for everyone. So, here's what we do. We recommend the Dessert Technique. You ever sit at a restaurant and at the end of a meal the waitress comes over to you and says, "Would you like to see the dessert menu?" Andrew Warner: Right. They never "Okay, can I sell you some dessert right now?" They say, "Would you like to see the dessert menu?" What they're doing is getting your permission to sell to you. We do the same thing in chat. If this running shoe example that I talked about were to play itself out, what I might do is, maybe five messages in, say, "Everything that we've talked about today really depends on having good back support when you're running. We make these shoes that will help you get better back support. Would you want to find out about them?" And then you have three buttons, one that says no, one that says maybe, one that says yes. Anyone who says no, you do not market to them, but instead what you do is you say, "Why not?" And you're gonna find out because they type back to you why not and you collect all those answers and you learn how to improve your chatbot, how to improve your product, or maybe, in addition to that, you also have a human being jump in and if someone says, "I actually don't think shoes will help my back," a human being can go in and say, "Well, what's going on with your back? Maybe there's another way that we can help you." And a human being can jump into a chat conversation anytime. Andrew Warner: Right? And anyone who says yes, then you now have permission to market to them, and what you do is you pause your sales for a little bit and the next day you say, "Yesterday you told me that you were interested possibly in our running shoes. Here's picture of them. Can I show you why they help your back? Can I show you why they help you reach your first 5K race?" And then you get them to understand what these shoes will do, and then you can sell. You can actually collect credit card information right there in Facebook Messenger, right in the chat app. Anna Hrach: So, it sounds like, really some of the core components to really making chatbots really useful, is one, having a solid understanding of the entire customer experience and journey and understanding what are those really key milestones at each point. But then also on the flip side, not assuming that that's the use case for everybody, and assuming that they just automatically want this content. Is that about right? Andrew Warner: This is something that most people don't know, is possible. I've gotta add it here. I know that we're talking mostly content here but eCommerce is important for a lot of our listeners. So, imagine this, imagine somebody puts a ... you know what, forget imagine. I'm gonna give you an actual example. I was on my flight to San Diego, sitting there on the tarmac waiting for the plane to take off and I was on a site called Pure Cycles. I'm a cyclist, I'm a runner, I love them all. I looked at this bike and I added it to my shopping cart, just because that's the way that I save things at times when I think about getting them. The plane took off. I lost the internet 'cause I didn't sign up for Gogo Wireless. I wanted some quiet time on the plane. I didn't complete the purchase. I land, and I'm ready to look for my hotel, and then I get an alert on my phone from Facebook Messenger and it says, "From Pure Cycles, forgot something?" I go, "I know these guys. I was just on their website." I tap the top of my phone screen to open up that alert, it's the exact bike that I put in my shopping cart, says, "Looks like you put this in your shopping cart but didn't complete the purchase," and then I have options through buttons underneath. I could buy it now, I could get a reminder for later, or I could have them just never bother me again. That's amazing. More than one out of 10 people who get that kind of message end up completing the purchase. That's super powerful and more than powerful, it shows you understand the user. This is what chatbots can do today. You have to experience it to see why people are so excited about it. Anna Hrach: Nice, okay, and what was that URL again that everybody could go to check it out? Andrew Warner: It's Pure Cycle or Pure Cycles. I'm gonna look it up right now. So, there are multiple sites now that do this. This is an eCommerce ... Pure Cycles. Anyone could attach this to their eCommerce store. Anna Hrach: Well, and the one thing that I love, too, is that they gave you the option to never receive messages again, which I think marketers and content marketers are so, like, no, but we don't want that. But just having that option doesn't mean they're gonna select it. It might just instill confidence that you're there to be a resource. Andrew Warner: What I might do in a situation like that is ask why not, and then you could start to understand why not. 'Cause maybe what you find if you ask why not is people say, "I can't buy on my phone. It's gonna take me too long." And so what you might do if you discovered that a lot of people say, "No, I don't wanna buy this, leave me alone," and then they respond, "Because I don't have enough time," you might add another option in the future that says, "Send me an email reminder." Email is more of a later when I have time to sit and look at this type of thing. Andrew Warner: And so you add that in. Or remind me when I'm on my desktop. There are lots of different options to handle that. Just because, like you said, you should give people the option to not hear from you, but you should understand why they wanna use that option. Maybe it's that you were confusing. Maybe you didn't do something right.